POF 5-piece mag catch set new for your MP5, MP5K or clone. Condition of each part is new and unissued. Set includes: mag catch, contact piece, spring, push button and roll pin. These are the parts needed to install a mag catch into your semi auto receiver. 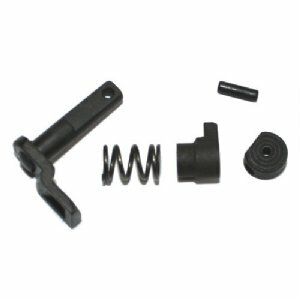 Mil-spec parts, perfect for all MP5, HK94, MP5K, SP89, PDW and clones. Quality HK contract production made by POF. Made on HK tooling to exact HK specifications. POF is a licensed MP5 producer.